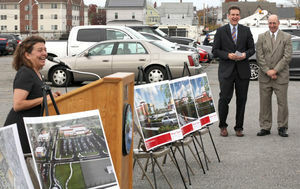 The state has pledged to grant $2 million to help improve infrastructure around the site where the city’s first Market Basket store will be built — on the site of the old General Electric Factory of the Future on Federal Street. Jay Ash, secretary of Housing and Economic Development for the Commonwealth of Massachusetts, announced the grant Friday at the site of the planned construction, which has been vacant since 1987. “The Baker-Polito administration is pleased to award Lynn $2 million,” Ash said. “We’re here to support your development. “I see special things happening here,” he said. Several state and city officials were in attendance at the meeting, which was held outdoors on the grounds of the site. Mayor Judith Flanagan Kennedy, Sen. Thomas M. McGee, Rep. Lori Ehrlich, Rep. Brendan Crighton, Rep. Donald Wong and Market Basket CEO Arthur T. DeMoulas spoke of their appreciation of the funding and their optimism for what it means for the city. “We really enjoy serving people, being a part of the community and helping to improve the community,” said DeMoulas. “We really enjoy serving the public,” DeMoulas said. “But it gives us equal and sometimes greater satisfaction to get involved with the community. It’s very, very rewarding to the whole organization to be able to pitch in and enhance these inner-city communities and to be a part of the community,” he said. The lot was purchased by Swampscott developer Charles Patsios in May 2013 after the city council voted to change the site’s zoning from light industry to business. The state MassWorks Infrastructure Award grant will fund road, sidewalk and traffic signal improvements. It will reconstruct and upgrade Federal Street, Western Avenue and Boston Street, and will support the city’s Market Square Revitalization Project. The project will redevelop the 22-acre space. Market Square will feature an 80,000 square foot Market Basket store, a parking lot behind the building, as well as 50,000 square feet of retail and office space. “We look at Lynn and see what we all believe is great potential,” said McGee. “Not only is it going to be a great option for shopping but it’s going to be a place people are going to want to go,” he said. The new store will create approximately 75 permanent full-time jobs and a total of about 400 full- and part-time jobs. It will commit to a policy of giving employment preference first to qualified residents of Lynn and second to qualified residents of surrounding communities. “I really believe there’s a renaissance here in Lynn and I’m excited to be a part of it,” Ash said. The grant is one of 49 that are being awarded across the state, he said. DeMoulas said developers would do the best job they could to keep the project on track and work is expected to begin in the spring. “Hopefully by this time next year we will be opening,” he said.